Lusso is a well established brand in cycling, they made their debut products way back in 1982. Being based in Manchester, Lusso are fairly local to us, now and again they pop into the shop to show us their latest products. 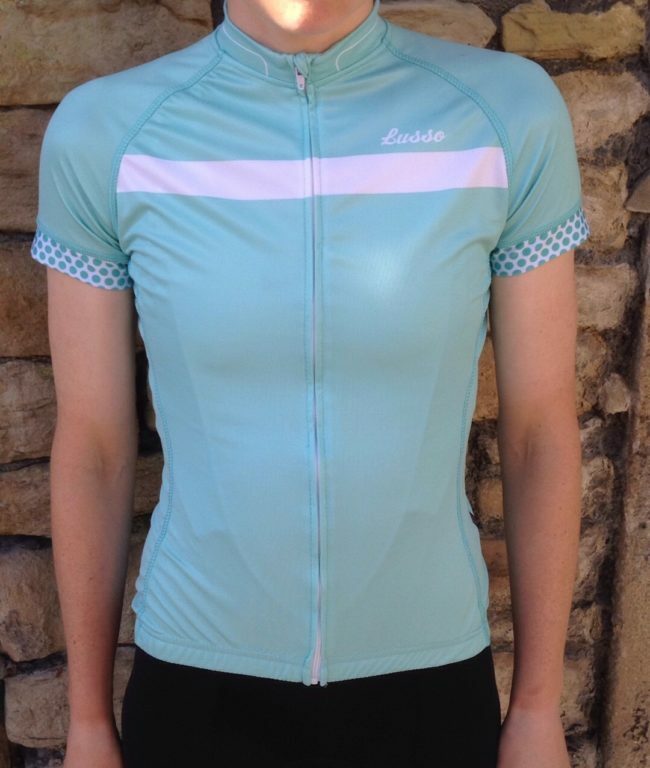 This summer, we got the new Lusso Layla women’s range. After a year in development, the range is finally on our shelves. With some decent July weather, I thought it would be a great opportunity to test out one of the jerseys. The Layla jersey is available in three different colours; black, pink and green. Although colour is very subjective, for me personally, it is refreshing to have a different colour option on the market – green! All too often women’s clothing is pink. ‘Shrink it and Pink It’ is a seemingly easy route for manufacturers to target women. Not so with Lusso, they have recognised that not all women are fans of pink. It’s good to see Lusso appreciate this fact and provide some alternative options. The attention to detail in the design, with the stripe across the chest and the polka dot band on the cuff, strikes a real balance; nice and feminine without being too loud or obvious. The jersey has the traditional 3 pockets set-up on the back. An unexpected added feature of a side zip pocket proved ideal for securing cash for those café days. 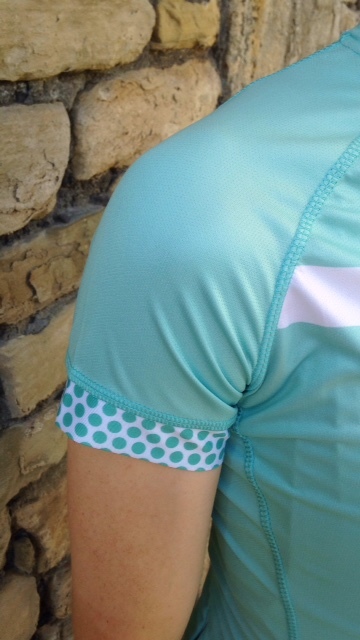 Another well thought out element of the jersey, is that It has factor 50 sun protection built in. This key feature means that you don’t have to worry about bib and sports bra tan lines, which is a real bonus in summer. 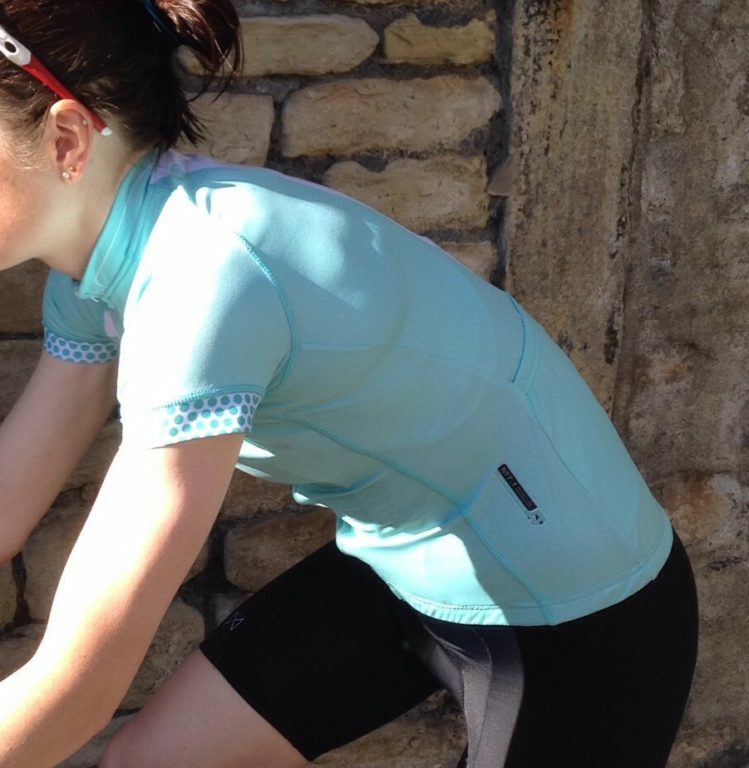 The Lusso Layla jersey is beautifully designed for summer weather. I am really looking forward to seeing other women’s clothing coming out of the Lusso factory gates in the future. The mix of subtlety, cleverly thought out features and design, should ensure that Lusso’s Layla range proves a popular choice. Tagged lusso clothing, lusso layla, lusso layla clothing, lusso womens, womens cycling, womens cycling clothing, womens cycling jersey, womens cycling jersey lusso. Bookmark the permalink.